Prehistoric animals with big, sharp teeth, like the sabre-toothed cat, also had strong arms, a new study has found. The fearsome combination made the creatures deadly predators, according to the study published in the Paleobiology journal. Palaeontologist, Julie Meachen, from the National Science Foundation (NSF) National Evolutionary Synthesis Center (NESCent) at Durham, North Carolina, in America, says, "It's hard to know which came first - long, fragile canines, or strong, robust forelimbs. It's sort of a chicken-and-egg question." False saber-toothed cats, called nimravids, and cat-like carnivores, the barbourofelids, also inherited the same characteristics that helped them hunt, says Julie. Saran Twombly, program director, from NSF's Directorate for Biological Sciences, which finances NESCent, says, "This is a nice demonstration that selection usually operates on suites of traits to generate solutions to environmental challenges. "In this case, the key to being an efficient predator integrated canines and forelimbs across different groups of felids and led to the development of different combinations of these traits. "It was the combination, rather than any single trait, that allowed a diverse group of organisms to thrive as predators," says Saran Twombly. The prehistoric cats' sharp teeth may have been up to 20inches (50cm) long, but, surprisingly, they were weaker than the teeth of modern-day cats, as their flatter sides and oval shape meant they were more liable to break, says Julie Meachen. "Cats now have canines that are short and round in cross-section, so they can withstand forces in all directions. "That comes in handy for hunting-their teeth are better able to withstand the stress and strain of struggling prey without breaking." 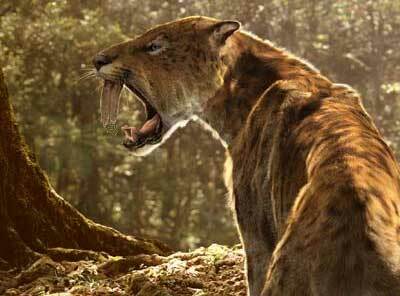 In a 2010 study, Julie Meachen stated that the Smilodon fatalis saber-toothed cat had strong arm bones. "Thick, robust bones are an indicator of forelimb strength," Meachen says. This suggests the creatures could have depended upon the forelimbs to capture and consume their prey without breaking their teeth. When Julie Meachen hundreds at fossils of similar prehistoric predators, she discovered they also had sharp teeth and strong forearms. Carnivorous nimravids roamed the earth between 42 and 7 million years ago along with extinct predators, the barbourofelids, which were wiped out 9 million years ago. Julie Meachen explains, "If you saw one of these animals you'd probably think it was a cat, but true cats didn't evolve until millions of years later." Experts discovered their upper canine teeth came in various shapes and sizes by studying fossils. Some species had canines that were short and round; others were long, with flat edges and were more oval. Some were serrated like a steak knife, Julie Meachen adds. Julie Meachen also studied conical teeth and arms bones from 13 species of modern-day cat and found that, in general, the larger the species, the bigger the bones. "The same correlated sets of traits arose repeatedly through time," she says.